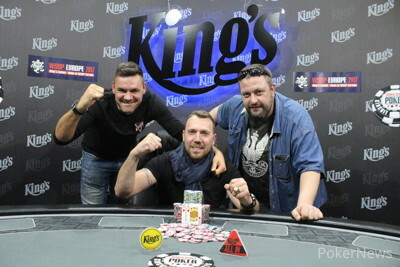 After a back-and-forth heads-up battle between Marcin Chmielewski and Boris Kotleba, it was the Polish player Chmielewski who finally emerged triumphant shortly before 3 a.m. local time. Coming into the final day Chmielewski navigated a tricky field to take home the gold ring as well as over €180,000 in prize money. "This tournament was difficult for me," he told PokerNews shortly after his victory, "But the heads-up maybe the most difficult. I was tired but my opponent played well and he had three times as many chips as me." "I gave him pressure a lot of times, maybe that's why I win. I tried to play my best, and I have definitely enjoyed my experience." 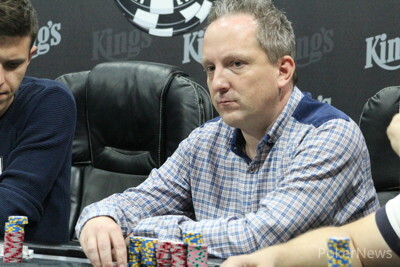 The day started with German Markus Prinz in the lead, but over the course of the day and on reflection the tournament as a whole, there was never a runaway chip leader, and the lead would swing between a number of players as the levels ticked by. Sickening hands littered the day, with Jorg Peisert rivering a gutshot to crack the aces of overnight chip leader Prinz, before Ngoc Bui Hai shoved his top pair into the rivered straight of Chi Quay Hoang to bust just as the final two tables were confirmed. At this point it was eventual runner-up Kotleba who led proceedings, but was pushed by Polish player Lukasz Wasek, especially after Wasek eliminated home favourite Martin Kabrhel when they both flopped sets, with Wasek’s set of eights ahead of his opponent’s set of fives. As the players approached the final table, there was no real action by anyone to grab proceedings by the scruff of the neck. In fact, the six eliminations leading to the final table of nine were done by six different players, such was the dynamic at the tables. By the time the final table did come around, it didn’t take long for our first casualty – one hand in fact, before overnight chipleader Markus Prinz ran his pocket queens into the pocket kings of Lukasz Wasek. Jiri Horak boosted his standings by eliminating Jeremy Williams, and later joined by Michal Schuh with the pair contributing to most of the raising, and thereby putting pressure on their tablemates. Wasek stuck around, but exited in sixth place for €39,995, closely followed by Chi Quay Hoang (5th – €51,205) and Jiri Horak (4th – €65,170). The final three consisted of Schuh, Kotleba and Chmielewski, and toward the beginning it looked like Schuh was going to walk away with it as a combination of good cards and well-timed aggression brought him to the head of proceedings. However, he would exit in third for €82,745 after he ran Queen-Ten into the pocket Aces of Kotleba to give the Slovakian the chip lead heads-up. He came into the contest with a 2:1 chip lead, which would soon grow even bigger and at one point touched on a 5:1 lead. After a short while however, it appeared as if Kotleba faded as the night drew on. With fatigue creeping in, Chmielewski pounced, albeit somewhat luckily. Kotleba moved all in holding two-pair, and Chmielewski held only pocket tens and a gutshot. The Polish player hit his gutshot, but Kotleba did not realise and celebrated before being brought back to reality. From then it appeared only a matter of time. Kotleba seemed deflated and Chmielewski looked to turn the screw. In the final hand Chmielewski spiked a Jack on the river to make a straight, crack the pocket threes of Kotleba and take down the tournament. Marcin Chmielewski opened with and Boris Kotleba shoved with . Chmielewski made the call. The board ran out . A dramatic run out saw the river deliver a straight for Chmielewski to finally defeat the tenacious and gracious loser Kotleba. Hand #208: Kotleba raised but folded to a three-bet. Hand #209: Chmielewski with opened on the button and took it down. Hand #210: Kotleba on the button with raise and take. Hand #211: Chmielewski with opened and saw a call from Kotleba with . Flop and a bet from Chmielewski was called to the turn . Tnd river was the and a bet from Kotleba saw a shove from Chmielewskiwith with the flush and he took it. Hand #212: Kotleba on the button holding opened and took the pot. Hand #207: Kotleba raised with to 380,000. Chmielewski three-bet to 1,300,000 with and Kotleba called. Both players checked the flop of . The turn was the and Chmielewski led for 1,100,000. Kotleba moved all in for 11,360,000 and Chmielewski called. The river was the and Kotleba exploded and stormed off, as if he had won the contest. Chmielewski tapped the table as the tournament officials counted out his double up, and he takes a strangle lock on proceedings. Hand #203: Kotleba raised from the button and took down the pot. Hand #204: Chmielewski got a walk. Hand #205: Kotleba limped from the button and his opponent checked. Kotleba bet the flop and his opponent folded. Hand #206: Kotleba got a walk. Hand #196: Marcin Chmielewski with raised the button and Boris Kotleba called with . 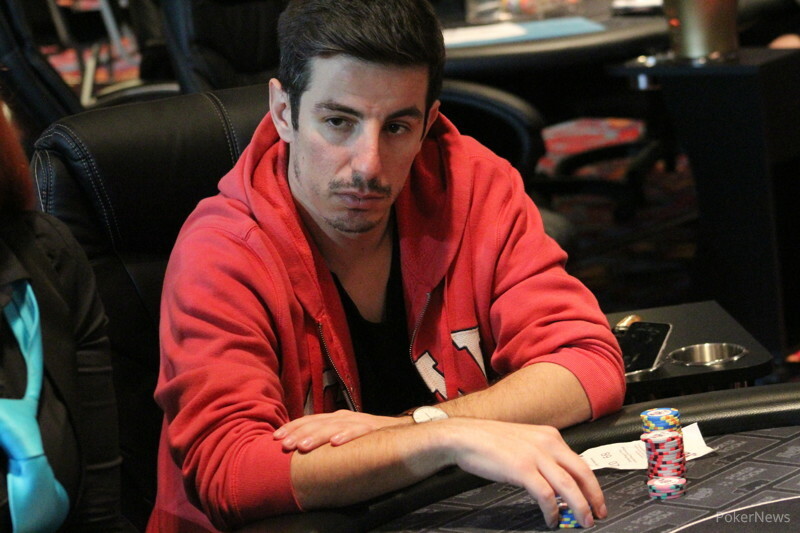 Kotleba hit two pair on the flop and went to the turn of . Kotleba bet and Chmielewski called. The river was the . Kotleba bet and Chmielewski gave it some thought but mucked. Hand #197: Kotleba opened with and Chmielewski raised with . Kotleba called and they checked to the turn . Chmielewski bet and Kotleba raised to 2,000,000. Chmielewski moved all in and took it down to take the chi plead for the first time. Hand #198: Kotleba opened with and Kotleba with called. The turn of saw Kotleba bet and Chmielewski raised. Kotleba with the set moved all in and Chmielewski folded. 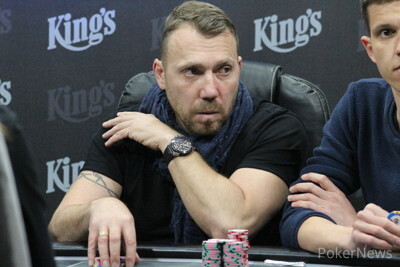 Hand #199: Chmielewski on the button with opened and Kotleba called with . Flop of and Kotleba led his set. Chmielewski raised and Kotleba shoved again. Chmielewski got away from it again. Hand #200: Kotleba shoved and took the pot. Hand #201: Kotleba with raise and take. Hand #202: Chmielewski on the button raised with and Kotleba defended . The flop was . Check-bet call and the turn was the . Chmielewski bet and take. Hand #194: Marcin Chmielewski limped with and Boris Kotleba raised to 460,000 with and Chmielewski called. The flop came and Kotleba bet 500,000. Chmielewski called. The turn was the and Kotleba bet 1,500,000. Chmielewski folded. Hand #195: Chmielewski got a walk. Hand #193: Another Turning Point? Hand #193: Kotleba raised to 380,000 with and Chmielewski three-bet to 1,600,000. Kotleba called. The flop came and both players checked. The turn was the . Chmielewski bet 1,000,000 and Kotleba folded. Hand #190: Kotleba raised out of turn with and Marcin Chmielewski with on the button called. Flop of and a bet from Kotleba took it. Hand #191: for Chmielewski and he raised the limp of Kotleba with . The flop was and Kotleba floated a bet. The turn and river was checked. Pot to Chmielewski. Hand #192: Chmielewski raised the button with and Kotleba three-bet . That got the job done.